A Year of Being Here: Tada Chimako: "Shade"
also came to sip from the pond. and scooped up the moon in his palm. to sip when overcome by night? will you find in your palm? "Shade" by Tada Chimako. Text as posted on Dragonfly's Poetry & Prolixity (07/10/2010). Translated from the original Japanese by Jeffrey Angles. Art credit: Untitled photograph by Bob King. Caption: "The full moon reflects in a pond near my home earlier this week. 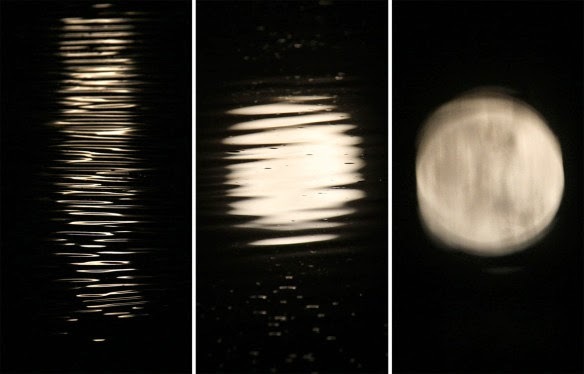 As waves spread and flatten (left to right), the moon's disk reforms on the water."